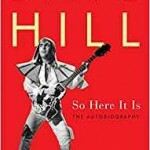 Share the post "Book review: SO HERE IT IS by Dave Hill"
Dave Hill was born in a castle in Devon, the son of a mechanic, and moved back with his parents to Wolverhampton when he was a year old. Much of the book involves his family and the facts he uncovered including that his parents weren’t married for their early years and how his mum’s depression impacted on the family. He touches upon this throughout the book, including how he didn’t cry when his mum died, and is very open and honest about how his mum affected and shaped his life. His wife Jan, who he married in 1973, remained his rock throughout the trails of life, be it with Slade or more personal aspects of his life. Slade fans will be interested to read about the band’s origins as Dave Hill originally played with drummer Don Powell in a band called The Vendors, which became the The N’ Betweens. When Jim Lea and singer Noddy Holder later joined, the band renamed itself Slade, after an album came out under the Ambrose Slade name. In the 1970s, Slade were the biggest band in the UK, racking up 23 Top 20 hits, including six number one singles. That is some achievement and of course their Christmas single ‘Merry Xmas Everybody’, still makes the singles charts every Christmas season. There isn’t much in the way of rock ‘n’ roll tales about other band members as they didn’t seem to socialise much on the road. The Reading comeback is covered, along with their failed attempt to break the US market – something that nearly broke the band. The mid-80’s to early 90’s period doesn’t get covered much, mainly as the band had stopped touring and when Noddy Holder left the band in 1992, Jim lea also retired from the band. Hill and Powell formed Slade II in 1992, which again isn’t touched upon much in the book, and that band’s current line-up has been together and touring since 2005. Slade II have released one studio album to date (much of the album was written by Hill and former Wizzard member Bill Hunt). This entry was posted in All Posts, BOOK REVIEWS and tagged book, classic rock, Dave Hill, Don Powell, Jim Lea, Noddy Holder, review, rock, Slade, Slade II, So Here It Is. Bookmark the permalink.